Weekend getaways with the family are such a pleasure, especially in this day and age. And I’m sure you deserve some much needed rest and relaxation, so I rounded up six destinations, all within reach by car from the metro, that you and your family can enjoy. These places are not only transpo-friendly (accessible by car), they’re super cool on the budget as well. Now who doesn’t love that? 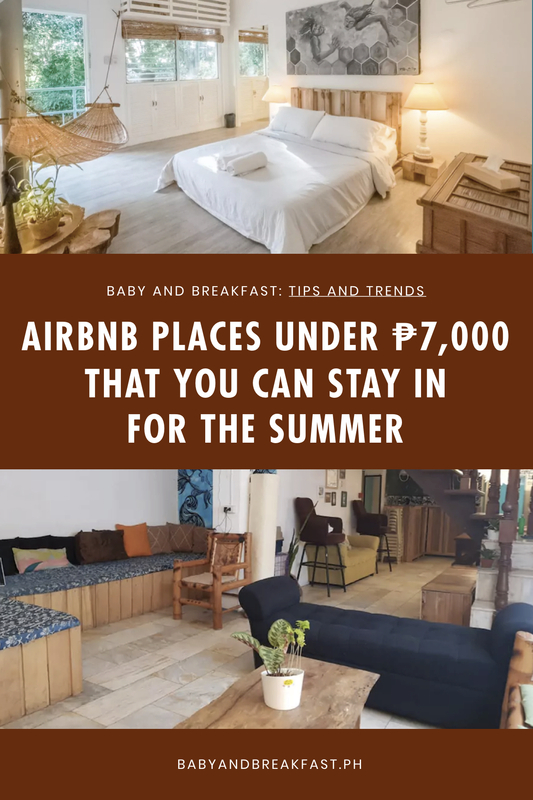 Check out our list of charming Airbnb places that are all less than ₱7,000! Quirky and colorful, this house is sure to brighten anyone’s mood. They offer a bedroom good for four people, and they serve free breakfast too! Doesn’t this place look so light and airy? This is the perfect place for six guests to unwind. It’s like a glamorous jungle retreat! This quaint house that fits five guests has a pristine river right in front of it. Talk about literally being in nature! Nestled in the hills, this room‘s not only got nature surrounding it, there’s a sea view fronting it as well, that six guests can enjoy! This huge house fits 12. It’s got lots of wood and white going on in its interior, plus a pool in the garden. Who knew resort feels could be so attainable so close to the city? You and your little ones are sure to love this charming cottage by the sea. It’s good for six guests… six times the fun in the sun, sea, and sand!